Collaboration tools such as Cucumber have gone great lengths to help us express the intent behind the requirements and improve the communication between the business, developers, and testers. Cucumber scenarios work best when they focus on high-level business goals and tasks, and not on detailed screen interactions. WebDriver gave us the power to easily manipulate complex interfaces of our systems, while Protractor with it’s intimate knowledge of Angular.js is an excellent low-level API to script the interactions with the system. So, is there something missing then? The key to writing high quality, scalable automated acceptance tests is to shift the focus from low-level interactions with the system to thinking about who the users of your system are, what is it that they want to achieve by their interaction with your system, and how exactly they’re going to do it. Serenity/JS builds on the Screenplay Pattern to do just that. This new library focuses on making developers and testers more productive by making acceptance tests faster to write, cheaper to maintain, and easier to scale to multiple projects and teams. 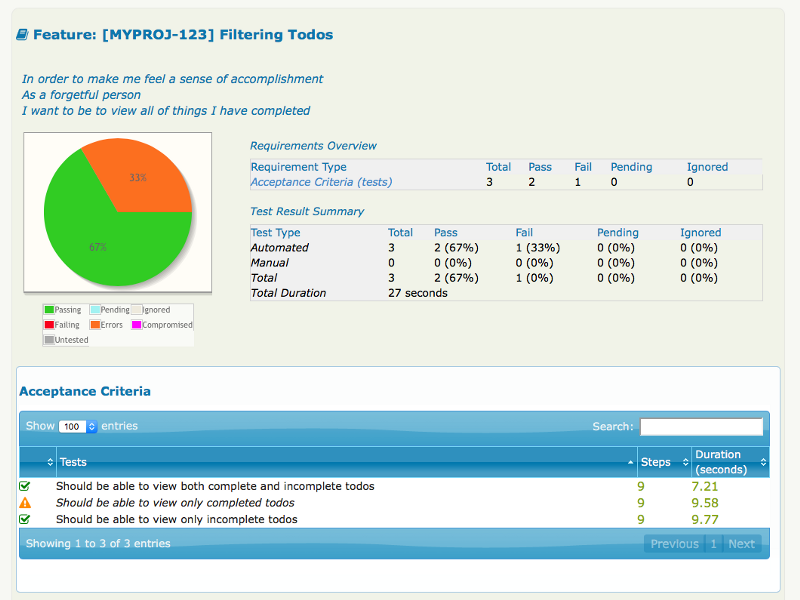 It also gives you the power of Serenity BDD Reports to help improve the visibility and build trust between developers, testers, and the business. In this article, we’ll show you how to get started. How will they complete each task? How will their specific interactions with the system look? We believe that the feature described in the above scenario will be useful to a “just-in-time kinda guy.” James is a persona that we are using to understand this specific role. Tasks are named using the vocabulary of the problem domain, such as: “Pay with a default credit card”, “Book a plane ticket”, or “Add item to the basket”. You might have noticed that the examples are implemented in TypeScript. The code should be easy to follow even if you’re not yet familiar with it and if you’re curious, you might want to watch Anders Hejlsberg’s “Introducing TypeScript”. An Interaction is a low-level activity directly exercising the actor’s ability to interact with a specific external interface of the system—such as a website, a mobile app, or a web service. Interactions are named using the vocabulary of the solution domain, such as: “Click a button”, “Enter password into a form field”, or “Submit JSON request”. Similarly to an interaction, a question directly exercises actor’s ability to interact with a specific external interface of the system—such as a website, a mobile app, or a web service. Calling Text.ofAll(…) returns a question implementing the Question<string> interface. It eventually resolves to a list of strings, representing the text of the web elements matched by the TodoList.ItemsTarget . Those clients could be a web browser, a web service client, a mobile device driver, and so on. But that’s not all. Serenity/JS also provides powerful reporting at the feature and capability level, allowing you to structure your test reporting in a way that is most meaningful to your stakeholders. Serenity/JS will not only report on what tests were executed, but it will tell you how well features were tested, and even what features and capabilities were not tested. 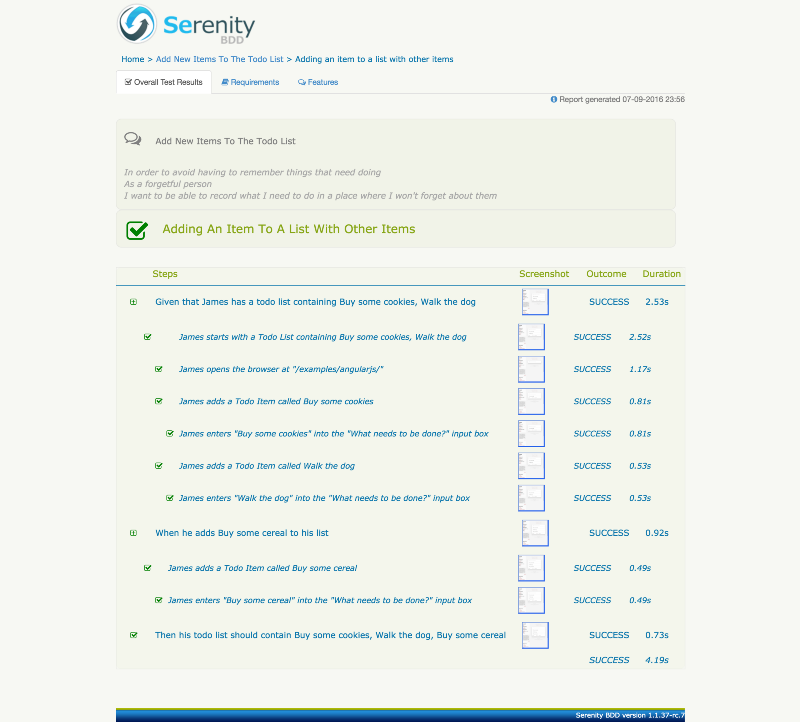 The aim of Serenity BDD reporting is not just to provide test reports, but to provide live documentation about the features of your system and their release-readiness. You can start experimenting with Serenity/JS today—check out the tutorials that we have prepared for you and let us know what you think!